The Dell SonicWall Threats Research team has received reports of a Trojan which leaves no trace behind and steals information from the infected system which is spreading in the wild. 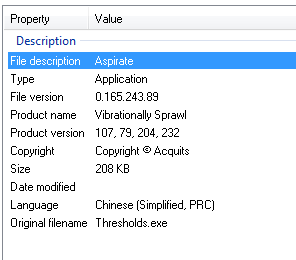 Upon looking at the properties, the trojan is described as an application in Chinese, named Aspirate. It does the following request multiple times to the C&C servers. Once it receives the reply, it sends encrypted information to the servers.